Never once in my 35 year existence had I even considered running anywhere other than on a football field, down a basketball court or around the bases – unless, of course, I was being chased. I never really could grasp why someone would want to run just for the sake of running. I couldn’t comprehend. Why run? Even with our amazing friend Kate running the Wrightsville Beach, NC Half Marathon this past March in support of Claire (see: www.clairescrusade.net), I still didn’t get it. Incidently, Kate ended up finishing in 2:19:46 at a pace of 10:49 – even after throwing out her back just days earlier. Mind you, she trained for this event in between caring for her 3 small children – and her husband Bobby – managing their growing household, and running her own business. So why run 13.1 miles with so much else to do? When our cousin Lauren told us she was going to run the Cleveland Half Marathon with her father, our Uncle Frank, and that they wanted to do so in honor of Claire, we were very moved by the gesture, but I still didn’t get why anyone would want to run that far for no apparent reason. 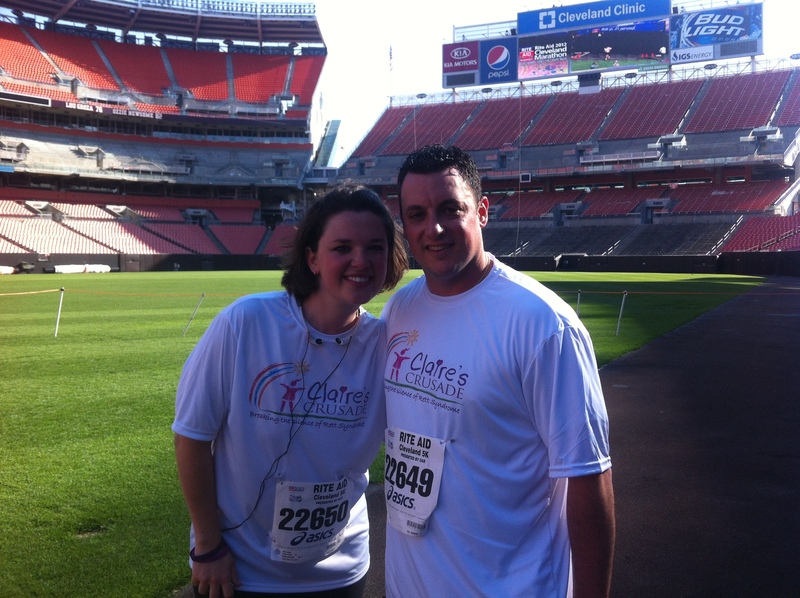 Putting my confusion aside, we set up Claire’s Crusade as an official Charity Partner of the Cleveland Marathon naming Frank and Lauren as team captains. 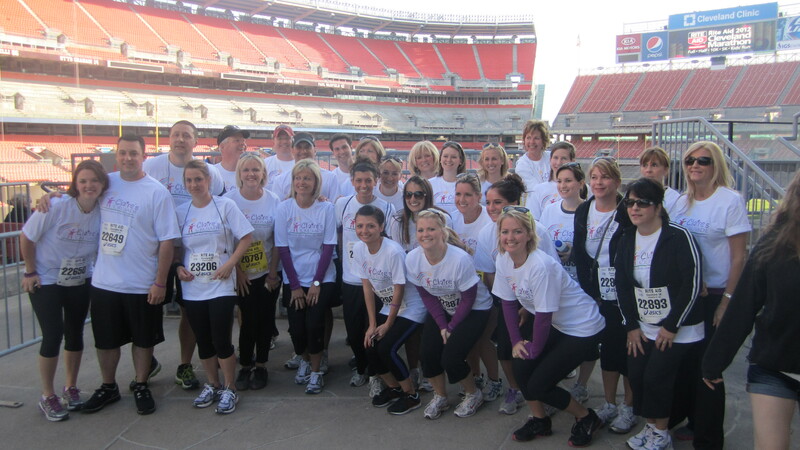 Come race day, Claire’s Crusade was represented by 45 runners and walkers participating in the 5K, 10K and Half Marathon. 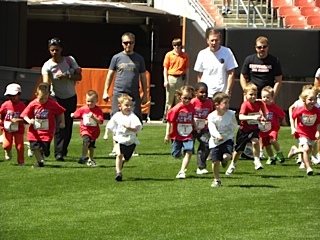 Additionally, we had 4 “mini crusaders” participate in the Kids’ Race! Our cousin John even organized the official Claire’s Crusade Marathon After Party. We left no doubt that we meant business. But why run? Standing with the other 1,064 people waiting to start the 5K race, I pondered what it was that I had gotten myself into exactly. I was about to run 3.1 miles longer than I wanted to and had no idea how I was going to do it. I had neglected one minor detail in my preparation for the day’s event – TRAINING. Somewhere during my 0:28:15 jog through downtown Cleveland the symbolism of it all hit me. I was running away from the fact that my daughter has Rett Syndrome, but with Claire’s Crusade proudly displayed on the front of my shirt, I was running toward the day when she will be able to run with me, toward the day when I first hear her speak. No matter what, I was not going to stop running until I reached the finish line. No chance I was quitting, no chance I was going to walk. Each hill on the course brought about thoughts of the ups and downs we’ve experienced since Claire’s diagnosis this past June. Thoughts of the emotional roller coaster we’ve been stuck on rushing by with each passing street. Suddenly, it was clear to me. Our “new normal” is a marathon. It’s a matter of pacing ourselves to go the distance. You see, after the diagnosis, we came out in a full sprint and, as a result, quickly burnt ourselves out. I don’t think it’s a coincidence that Kate, Lauren, Frank and the rest of Claire’s Crusaders, and now a great friend of Col’s from Notre Dame, Billy (who is training to run the Chicago Marathon in October – yes, the full MARATHON – in the name of Claire’s Crusade), introduced us to distance running. I truly believe it is a sign from above to slow down. There’s no question that we’re in for a very long race and we won’t last very long at the pace we’ve been going. Seeing nearly 50 people participate throughout the weekend sporting Claire’s Crusade gear literally brought me to tears. In a distance race, it’s real easy to feel alone and isolated as, at times, it’s just you and the pavement. Then you turn the corner and see friends and family cheering you on, or a teammate runs by and gives you a motivational tap on the behind, or when you can see the finish line but you’re not so sure how you’re going to make it there until a teammate comes out of the blue to run by your side to the end. You quickly realize that you’re not alone. It’s hard to describe that moment and put it into words, but it is as if a giant weight is lifted off of your shoulders. To each one of Claire’s Crusaders, and to those of you that were crusading with us this past weekend in spirit, we thank you for your support. There truly is comfort in knowing that we won’t be running this race alone. 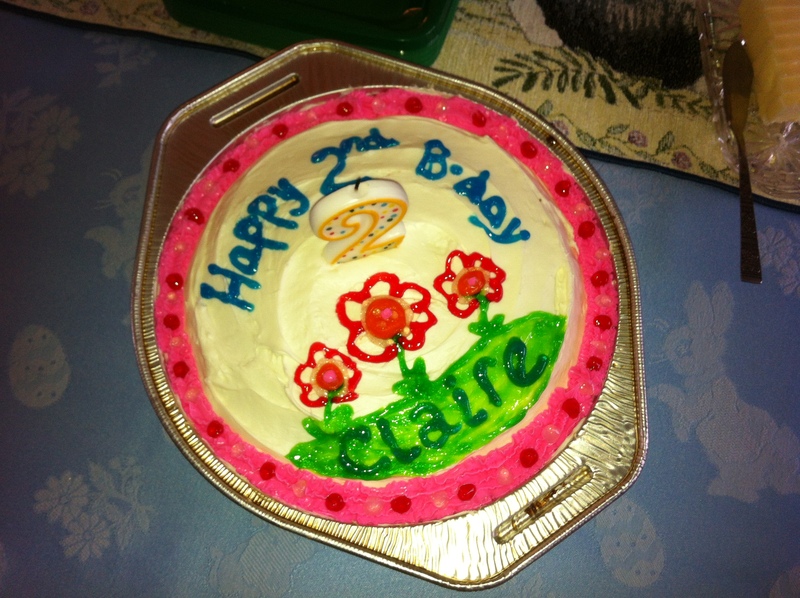 Happy 2nd birthday to Claire! Her birthday fell on Easter Sunday this year, and it was a beautiful day. Her face lit up when we told her she was such a big girl. In fact, she danced proudly every time she heard the Happy Birthday song. We’ve been busy this past month finishing up the creation of what we refer to as Claire’s medical baseline. In the beginning of April, Claire went through a clinic at the Pediatric Center for Airway, Voice and Swallowing. Claire was seen by experts specializing in Pediatric Otolaryngology (ENT), Pediatric Pulmonary, Pediatric Gastroenterology, Pediatric Speech Pathology & Swallowing, Nutrition, and Pediatric Rehabilitation & Therapy. The wait list to get into this clinic was long, but well worth it. The physicians and experts cycled through our room and after our visit, all met to discuss Claire’s condition and associated recommendations. It was determined that Claire definitely needed tubes in her ears, and while under anesthesia, she should have an upper endoscopy completed to rule out damage to her esophagus from possible acid reflux. During surgery, Claire should also have her tonsils and adenoids checked, along with a procedure to check her hearing. 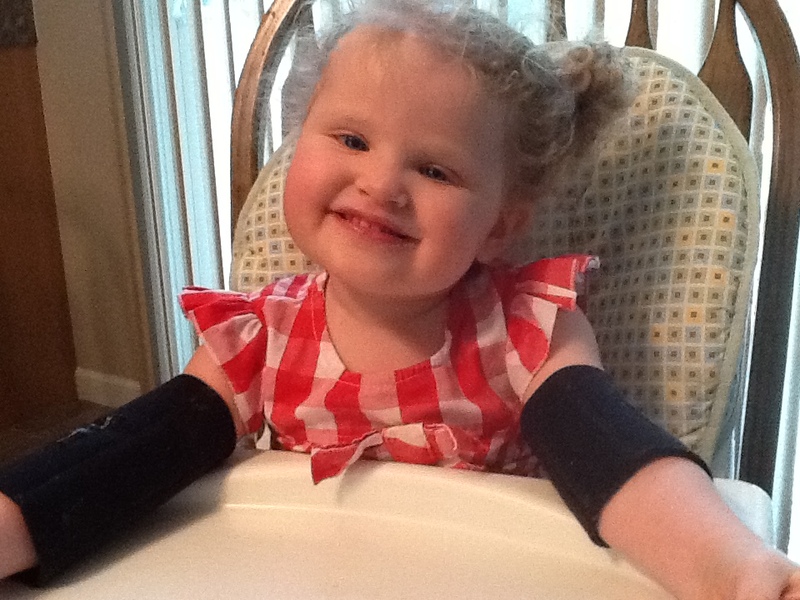 Claire underwent surgery last week, and everything went well. 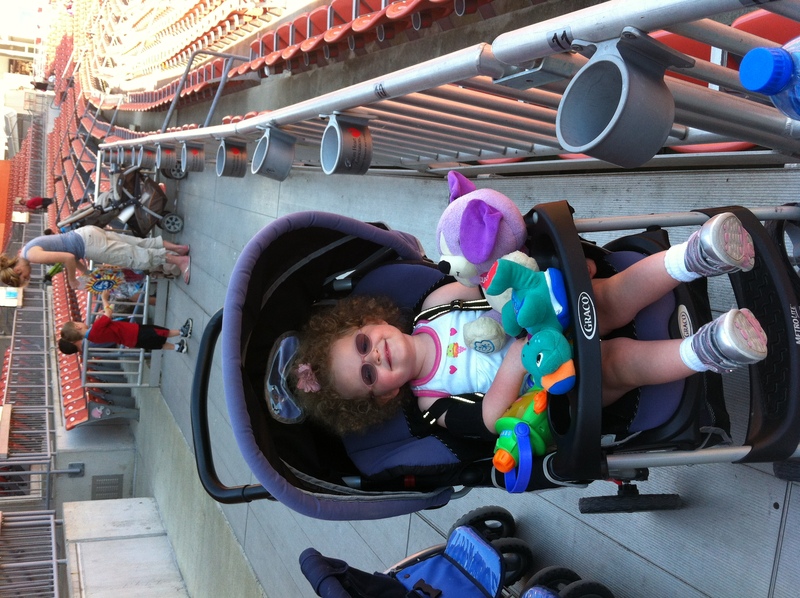 During the past month, Claire also visited the Feeding Clinic at the Cleveland Clinic Children’s Hospital. Claire’s feeding evaluation team consisted of a Developmental Pediatrician, a Clinic Psychologist Program Director, a Clinical Dietician, and an Occupational Therapist. The team monitored Claire’s feeding behaviors as she ate and drank under their careful observation. Claire also underwent her 2nd swallow study. Recommendations coming out of the Feeding Clinic and swallow study include pureeing Claire’s food as she gags on other textures. Claire’s ability to drink will also require more attention. She will continue her steady diet of 50/50 Pediasure and milk, but we will look to transition her off of the bottle. This transition is easier said than done. Over the past year and half, I think we’ve tried every “sippy cup” on the market with no luck. Claire has difficulty forming her mouth the right way around the nozzle or straw. Currently, for water and juice, we use a medicine dropper to get her the additional liquids she needs. Her team had some great suggestions though, which we will incorporate. We will also begin to thicken all liquids with a special Rx gel; we’ve only tried it a couple of times, but it seems to help thus far. Claire is still attending the Mobility Clinic as well as her typical 8 therapies a week. Yes, with the completion of these clinics, along with the prior visits she had with 35 specialists in the past year, I am happy to say Claire’s medical baseline is now F.I.N.I.S.H.E.D. We finally understand where Claire is today, literally from head to toe. This baseline will help us know as she grows, where we need to focus if she regresses, or where to celebrate, if you will, in the areas where she has progressed. After Claire’s diagnosis last summer, Sean and I started going to a Rett Support group. I remember blankly staring at other Rett moms when they told me during one of the first sessions that we’d eventually get used to our new normal of doctors’ appointments, etc. 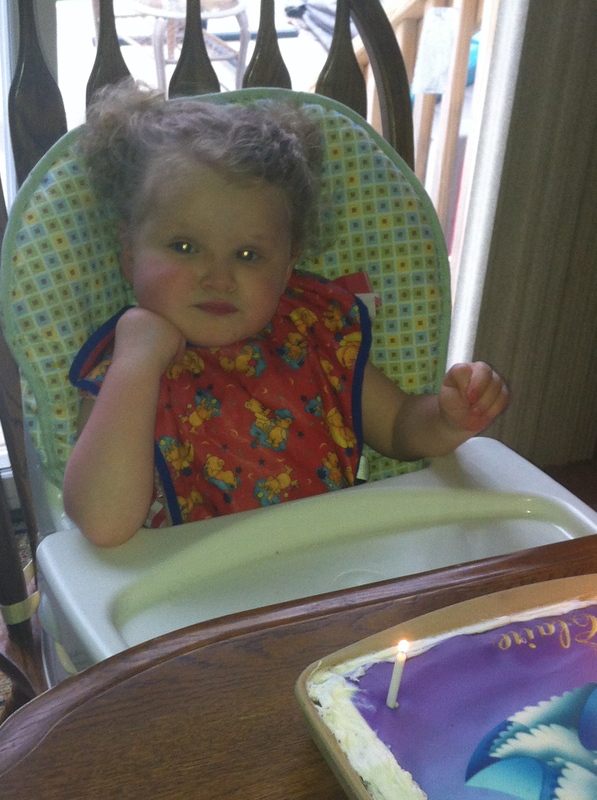 They told me that things would gradually get easier as Claire’s care plan would eventually come together. I remember at that time being so overwhelmed and feeling like this would never be possible. I can’t believe it but a year later, here we are. We have arrived at our new normal. Claire’s baseline is finished, and her care plan is in place. We have a medical team, we know where we need to focus our efforts, and we know our next steps. We know what questions to ask. We feel comfortable finally, and for this, we are thankful.